Aim of Study: This review aims to highlight that bosutinib represents a valuable alternative for patients already treated unsuccessfully with one or more other tyrosine kinase inhibitors (TKIs). Chronic myelogenous leukemia (CML) is a myeloproliferative neoplasm associated with a specific genetic abnormality resulting in a fusion protein with an active tyrosine kinase region. Therefore, TKIs were developed as a suitable treatment option. Methods: Full-text articles, abstracts, and meta-analysis comparing the efficacy and safety of the five TKIs were included in the review. Efficacy of these enhanced therapies is estimated on the basis of achievement of a complete cytogenetic response (CCyR) and this outcome is an important goal as a surrogate marker for improved survival. Results: Bosutinib's efficacy is comparable to that of imatinib in the first-line setting and with dasatinib and nilotinib as second-line therapy, while its safety profile is distinctly different. Most therapeutic guidelines for CML recommend an initiation of therapy with imatinib and application of dasatinib and nilotinib as subsequent lines. Conclusion: Bosutinib is generally not recommended despite its demonstrated efficacy and manageable toxicity. However, resistance, intolerance, specific mutations, as well as disease progression are often the reasons for the lack of sufficient response to therapy registered by the lower rates or complete absence of CCyR. Treatment options are limited for these patients. Chronic myelogenous leukemia (CML) is a myeloproliferative neoplasm with an incidence of 1–2 cases per 100,000 adults, with increasing incidence with age and a slight male predominance of 1.3:1. The pathogenesis of CML involves a specific genetic abnormality involving the fusion of the Abelson murine leukemia (ABL) gene on chromosome 9 with the breakpoint cluster region (BCR) gene on chromosome 22. The resultant BCR-ABL fusion protein contains the constitutively active tyrosine kinase region of ABL that produces a proliferative signal that regulates growth and replication. The causal role played by BCR-ABL in leukemogenesis, specifically as it relates to CML, has led to the development of tyrosine kinase inhibitors (TKIs). TKIs mitigate the oncogenic activity of the BCR-ABL protein through competitive inhibition at the ATP-binding site, leading to the inhibition of phosphorylation of proteins involved in BCR-ABL-mediated intracellular signal transduction and thereby causing the arrest of growth and apoptosis in CML cells. In 2013, European LeukemiaNet recommended imatinib (400 mg once daily), nilotinib (300 mg twice daily), and dasatinib (100 mg once daily) for first, second, and subsequent lines of treatment of CML. At that time, bosutinib (500 mg once daily) had been approved by the Food and Drug Administration (FDA) and European Medicines Agency (EMA) for patients resistant or intolerant to prior therapy. In the 2015 review of these recommendations, three TKIs (imatinib, nilotinib, and dasatinib) were indicated for first-line therapy; bosutinib and ponatinib were available second line while only ponatinib was particularly indicated in case of the T315I mutation. According to the report of EMA, 2014, a positive benefit-risk balance could not be established for bosutinib compared with imatinib in view of the pronounced toxicity (particularly hepatotoxicity and gastrointestinal toxicity) and failure to show superior efficacy. Bosutinib was associated with clinical benefits in patients who had exhausted all available TKI therapies or for whom treatment with other available TKIs was deemed unsuitable by their physicians. For these patients, there are currently limited or no treatment options, and bosutinib may offer a valuable alternative. The realization that achievement of a complete cytogenetic response (CCyR) was associated with a survival advantage made this outcome an important goal as a surrogate marker for improved survival. With enhanced therapies, CCyR rates increased from 5% to 25% with IFNa, to 50%–85% with imatinib, and up to 95% with the newer agents. However, as patients advanced from first line of therapy to 2nd line and beyond, the probability of achieving CCyR decreased. For example, in the IRIS trial, the rate of CCyR among patients receiving imatinib as initial therapy for CML in chronic phase (CP) was 83%. For patients receiving dasatinib or nilotinib after imatinib failure, the reported rate of CCyR was 45%–50% but only 24% when these agents were used as the third line of therapy. A search of PubMed, Medline, ScienceDirect, FDA, EMA, National Council on Prices and Reimbursement of Medicinal Products, and Bulgarian National Cancer Registry websites was performed with the following keywords: chronic myelogenous leukemia, tyrosine kinase inhibitors, pharmacotherapeutic recommendations, imatinib, nilotinib, dasatinib, bosutinib, ponatinib, efficacy, safety, and cost-effectiveness. Full-text articles, abstracts, and meta-analysis comparing the efficacy and safety of the five TKIs were included in the review. The aim of this review is to underline the importance of bosutinib as a valuable alternative for patients with CML who have exhausted all other treatment options. This is especially true for the Bulgarian environment where TKI ponatinib does not have a marketing authorization. Bosutinib is an oral, dual Src/Abl TKI with more potent inhibitory activity against Bcr-Abl than imatinib in CML cell lines and minimal inhibitory activity against c-KIT or platelet-derived growth factor receptor, two nonspecific targets potentially associated with toxicities reported for other second-generation TKIs. A major clinical trial that investigated the effects of bosutinib as a first-line treatment of CML is BELA trial (Bosutinib versus Imatinib in newly diagnosed chronic myeloid leukemia trial), an open-label, randomized, multinational, phase III study which compared the efficacy and safety of bosutinib 500 mg/day (n = 250) with imatinib 400 mg/day (n = 252) in newly diagnosed Philadelphia chromosome-positive (Ph+) CP CML patients who had received no prior antileukemia treatment. Results showed that BELA did not meet its primary end point of CCyR at 12 months as it was similar between patients receiving bosutinib (70%; 95% confidence interval [CI], 64%–76%) and imatinib (68%; 95% CI, 62%–74%; P = 0.601). Median time to first CCyR was faster with bosutinib (12.9 weeks; 95% CI, 12.6–13.4 weeks) compared with imatinib (24.6 weeks; 95% CI, 24.3–25.6 weeks; P < 0.001), with higher rates of CCyR at months 3, 6, and 9 for bosutinib. The cumulative rate of CCyR by 12 months was also similar between bosutinib and imatinib (79%; 95% CI, 74%–84% vs. 75%; 95% CI, 69%–80%, respectively). The major cytogenetic response (McyR) rate at 12 months was 73% for bosutinib and 78% for imatinib. The major molecular response (MMR) rate at 12 months was higher with bosutinib (41%; 95% CI, 35%–47%) than with imatinib (27%; 95% CI, 22%–33%; P < 0.001), with the complete molecular response (CMR) rate at 12 months being 12% compared with 3%, respectively (P < 0.001). The rate of confirmed complete hematologic response (CHR) at 12 months was 71% for bosutinib versus 85% for imatinib (P > 0.999). Median times to first CHR were 4.4 weeks (95% CI, 4.3–4.7 weeks) for bosutinib and 4.6 weeks (95% CI, 4.4–5.0 weeks) for imatinib (P = 0.5790). Bosutinib did not demonstrate a superior rate of CCyR at 12 months versus imatinib based on the intention-to-treat population, which was the primary end point of the study. However, bosutinib treatment did demonstrate superiority in some secondary end points which explore efficacy such as MMR, CMR, and CHR at 12 months, time for first response, duration of the response, and overall survival. Brümmendorf et al. reported that the CCyR rates at 24-month follow-up of BELA trial were similar between bosutinib and imatinib (58% and 65%; rate difference [95% CI], −8% [−16%, 1%]) as were cumulative CCyR rates by 24 months (79% and 80%; rate difference [95% CI], −1% [−8%, 6%]). At 24 months, MMR rate was 47% for bosutinib and 41% for imatinib. Cumulative MMR rate by 24 months was 59% with bosutinib and 49% with imatinib (rate difference [95% CI], 10% [2%, 19%]). Cortes et al. investigated the efficacy and safety of bosutinib as second-line therapy in patients with imatinib-resistant or imatinib-intolerant CP CML. Most patients (n = 247/287 [86%]) in the evaluable population for hematologic response achieved a CHR, with a median time to CHR of 2.0 weeks. At 24 weeks, 31% (95% CI, 26%–37%) of all treated patients achieved a McyR, including 33% (95% CI, 27%–40%) imatinib-resistant and 27% (95% CI, 18%–38%) imatinib-intolerant patients. Among patients who achieved a CCyR and were evaluable for molecular response, 64% (n = 35/55) of imatinib-resistant and 65% (n = 15/23) of imatinib-intolerant patients achieved a MMR; 49% (n = 27/55) and 61% (n = 14/23) achieved a CMR, respectively. Data from the 2-year follow-up of Cortes et al., 2011 showed that the cumulative response rates to bosutinib were as follows: 85% achieved/maintained CHR, 59% achieved/maintained McyR (including 48% with CCyR), and 35% achieved MMR. Responses were durable, with 2-year estimates of retaining response >70%. Two-year probabilities of progression-free survival and overall survival were 81% and 91%, respectively. According to De Souza et al., CP CML patients resistant to imatinib and dasatinib or imatinib and nilotinib therapy achieve CHR in 62% and 75% when treated with bosutinib, respectively. CCyR was observed in more than 30% in both cases. In a subpopulation analysis of the trial of Cortes et al., Khoury et al. assessed the efficacy and safety of once-daily bosutinib in patients with CP CML who had been pretreated with imatinib followed by dasatinib and/or nilotinib. MCyR was attained by 32% (n = 35) of patients, with CCyR in 24% (n = 26) of patients, including one of 3 patients who were previously treated with all 3 TKIs. A confirmed CHR was achieved or maintained by 73% of the patients including 65% of patients who did not have a CHR at baseline. Bosutinib did demonstrate potential benefits in patients with newly diagnosed CP CML. Based on the presented data and the limited treatment options currently available for patients previously treated with 2 or more TKIs in CML, bosutinib may provide an effective therapeutic option for these patients. Bosutinib showed an acceptable safety profile in the first-, second-, and third-line therapy of CML patients. Bosutinib, compared with imatinib as first-line therapy in the BELA trial, was associated with higher incidences of diarrhea, vomiting, and abdominal pain. The most common drug-related cardiac adverse events (AE) was prolonged QT interval >500 ml at about 1% of patients on bosutinib for QTcF and QTcB and <1% for QTcB in patients on imatinib. Liver aminotransferase elevations were greater in the bosutinib group compared to the imatinib group (ALT: 22% vs. 3%; aspartate transaminase [AST]: 11% vs. 3%). Elevated levels of lipase were found in 7% of patients in the bosutinib and 5% of patients treated with imatinib. BELA study proved that bosutinib had a different toxicity profile than imatinib. Analysis of the BELA study by Brümmendorf et al. reaffirmed the conclusions of Cortes et al. after 2 years of follow-up. Discontinuations due to AE were established at a larger rate in the group of bosutinib (25%) compared to imatinib (9%). Cardiovascular AE was similar in the two groups. In 2014, an analysis of the safety profile of patients from BELA study after 30 months of follow-up was accomplished. Among the nonhematological side effects, bosutinib was associated with a significantly higher occurrence of gastrointestinal side effects such as diarrhea (70% vs. 26%, P < 0.001), vomiting (33% vs. 16%, P < 0.001), abdominal pain (14% vs. 8%, P = 0.029), fever (19% vs. 12%, P = 0.046), and pleural effusion (4% vs. <1%, P = 0.006) compared to imatinib. Patients treated with bosutinib versus imatinib showed slight expression of the following side effects: edema (periorbital edema: 2% vs. 14%, P <0.001; peripheral edema 5% vs. 12%, P <0.006), myalgia (5% vs. 12%, P =0.010), muscle spasms (5% vs. 22%, P <0.001), and bone pain (4% vs. 11%, P =0.003). The manifestations of cardiovascular side effects were 8% and 6% for bosutinib and imatinib, respectively. Vascular side effects include hypertension (6% vs. 4%) and hematoma (2% vs. 1%). Some biochemical parameters were elevated-alanine aminotransferase (33% vs. 9%, P <0.001) and aspartate aminotransferase (28% vs. 10%, P < 0.001) while treatment with bosutinib is associated with lower levels of hypophosphatemia (8% vs. 20%, P < 0.001) and lower levels of creatinine phosphokinase (8% vs. 20%, P < 0.001). Neutropenia (13% vs. 30%, P < 0.001) and leukopenia (9% vs. 22%, P < 0.001) did not occur frequently in treatment with bosutinib versus imatinib. Skin toxicity (rash) was observed in 35% and 25% of patients treated with imatinib and bosutinib, respectively. Cortes et al. conducted a phase 1/2, open-label, 2-part study in patients with Ph+ CML exhibiting imatinib resistance (primary or secondary resistance) or intolerance who receive bosutinib as a second-line treatment. The most common treatment-emergent AEs were diarrhea (84%), nausea (44%), rash (44%), and vomiting (35%). These events occurred early and were generally transient. Less common AEs included fluid retention (15%), pleural effusion (4%), and muscle-related AEs (muscle spasms [3%], musculoskeletal pain [3%], creatine kinase elevations [2%], and myalgia [5%]). Possibly, drug-related cardiac events were observed in 5% of patients. Grade 3/4 hematologic toxicities were thrombocytopenia and neutropenia., On-treatment grade 3/4 elevations of ALT and AST were experienced by 10% and 5% of patients, respectively, with incidence rates similar between imatinib-resistant and imatinib-intolerant patients. Khoury et al. investigated the safety of bosutinib as third-line therapy after imatinib, followed by dasatinib and/or nilotinib with duration of 28.5 months. Again, the most common side effects associated with bosutinib treatment were diarrhea (81%), nausea (43%), vomiting (32%), thrombocytopenia (25%), neutropenia (19%), and anemia (8%). Hematologic toxicity was one of the most commonly reported reasons for dasatinib intolerance, and some cross-intolerance was observed with bosutinib: 8 (40%) of these patients experienced a grade 3/4 hematologic cross-intolerance event on bosutinib and 2 (10%) discontinued bosutinib because of myelosuppression. The authors found low rate of elevations of ALT (7%) and AST (3%). On the other hand, treatment with bosutinib is associated with lower incidence of muscle cramps, fluid retention, myalgia, and cardiovascular complications. Bosutinib showed an acceptable safety profile as first-, second-, and third-line therapy for patients with CML. Because of this, bosutinib may prove to be an acceptable alternative for imatinib, nilotinib, and dasatinib. Although the significant development of cancer therapies in the last decade (imatinib (2001), dasatinib (2006), nilotinib (2007), bosutinib (2010), and ponatinib (2012)) has led to an increase of the 10-year survival rate in patients from 20% to 80%, health costs for these new TKI therapies in the United States have increased from $ 30,000 per year for imatinib to the range of $92,000–$138,000 for 2012. Data from pharmacoeconomic evaluation of TKI therapies are controversial. Breitscheidel evaluated the cost utility of allogeneic stem cell transplantation with matched unrelated donor in newly diagnosed, CP CML patients, relative to the treatment with imatinib. The authors concluded that the cost utilities of both therapies are comparable even though highly dependent on the price of imatinib. Reed et al. and Chen et al. compared imatinib with conventional immunotherapy and concluded that imatinib is cost effective., Hoyle et al. compared the two targeted TKI therapies – dasatinib and nilotinib, to high-dose imatinib in patients with CP CML resistant to imatinib. The authors suggested that until longer follow-up data for progression-free survival and overall survival are available, the cost-effectiveness of dasatinib and nilotinib for imatinib-resistant people is highly uncertain. In another study, Ghatnekar et al. reached the conclusion that dasatinib is cost-effective compared to high dose of imatinib. The results of Kluibenschaedl et al. showed that neither bosutinib nor dasatinib was cost-effective when compared to nilotinib as second-line treatment after imatinib. In Bulgaria, prices of TKI therapies are determined by their inclusion in the positive drug list. The reference prices per mg for imatinib, nilotinib, dasatinib, and bosutinib are 0.410969 BGN, 0.368038 BGN, 2.340153 BGN, and 0.608366 BGN, respectively, while ponatinib does not have a reference price. As shown in [Table 1], the expenses for annual treatment with nilotinib are 80,600.32 BGN, with dasatinib – 85,415.38 BGN. At the same time, the cost of annual therapy course with bosutinib is considerably higher – 111,026.98 BGN. According to the therapeutic indications for each of the five TKIs given in the Summary of Product Characteristics (SmPCs), imatinib, dasatinib, and nilotinib are all recommended for first-line treatment of patients with CML in the CP. Imatinib is a possible choice in case of lack of efficacy of interferon therapy, while dasatinib and nilotinib should be given when the patient has intolerance or resistance to imatinib. Bosutinib and ponatinib are available as second- or third-line therapy.,,,, Recommendations of the National Institute for Health and Care Excellence (NICE) are similar concerning the possible application of imatinib and nilotinib. 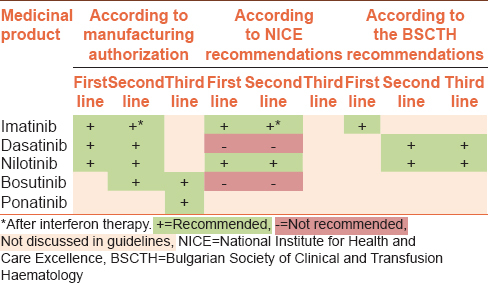 However, they recommend neither dasatinib nor bosutinib.,, The recommendations of the Bulgarian Society of Clinical and Transfusion Haematology (BSCTH) mention imatinib as first-line therapy and dasatinib and nilotinib as a possible choice for first- or second-line therapy for patients with CML. A comparison of these pharmacotherapeutic recommendations is provided in [Table 2]. Evaluation of the efficacy of the treatment has to be based on the presence or absence of response. Alternative therapy is to be sought in the following cases: lack of CHR after 3 months; when a CHR is present but there is no cytogenetic response after 6 months; if after 12 months of therapy, there is not at least partial cytogenetic response or lack of at least CCyR after 18 months. Based on the recommendations provided by NICE, BSCTH, and the indications described in the SmPCs as well as the above-mentioned criteria for the evaluation of efficacy of the therapy, an algorithm for the treatment of newly diagnosed patients with CML can be illustrated in the following way [Figure 1]. According to the Bulgarian national cancer register, the newly diagnosed patients with CML in 2012 are 202. If the therapeutic algorithm in [Figure 1] is followed, all of them would take imatinib as first-line therapy. At 6 months, around 69.0% (140 patients) are expected to achieve CCyR. The rest 31.0% (62 patients) would be subjected to dasatinib or nilotinib as second-line therapy. Evaluation of efficacy of dasatinib treatment showed that around 77% (48 patients) reached CCyR within 12 months. Third-line therapy with bosutinib would be applicable in 23% (14 patients). Data from the study of Khoury et al., 2012 suggested that around 28% of patients treated with bosutinib achieved CCyR which means that in Bulgarian circumstances, 4 patients are likely to be successfully treated with bosutinib. The total cost for the annual therapy of these 4 patients would amount to 444,107.20 BGN. Observation of the clinical practice in Bulgaria showed significant differences compared to the methodological guidance of BSCTH. Instead of imatinib, dasatinib and nilotinib are used in approximately 90% of newly diagnosed patients. This practice is in accordance with the findings of Pavey et al. who established that dasatinib and nilotinib produce better results than imatinib in newly diagnosed patients: for 12 months, the rates for CCyR were around 80% for dasatinib and nilotinib and around 70% for imatinib. The algorithm in this case is presented in [Figure 2]. In this case, 182 patients (90% of 202 newly diagnosed patients with CML in 2012 according to Bulgarian national cancer register) begin treatment with dasatinib or nilotinib. After 12-month therapy, the expected number of patients who achieve CCyR is 146 (80%). The other 36 (20%) patients for whom the treatment is not successful are to start an alternative medication – bosutinib as second-line therapy. In this case, the expected efficacy is 41% which means that 15 patients should achieve CCyR while treated with bosutinib. The estimated annual cost of patients who are expected to be treated with bosutinib as second-line therapy, after failure of first-line treatment with nilotinib or dasatinib, is 1,665,402 BGN. There is increasing evidence that second-generation TKIs offer improved responses in comparison with standard-dose imatinib when used as first- or second-line treatment of patients with CML. Bosutinib demonstrated durable clinical activity as first-, second-, or subsequent-line therapy in patients with CML, with results generally comparable to those reported for imatinib in the first-line setting and with dasatinib and nilotinib as second-line therapy. Because of its distinctly different and manageable toxicity profile, bosutinib is a possible alternative to imatinib, nilotinib, and dasatinib. A disadvantage of bosutinib is its higher price which is the reason why authors determine that it is not cost-effective. However, the observation of therapeutic algorithms in Bulgaria has shown that there are a number of patients whose treatment with one or more TKIs is unsuccessful due to resistance or intolerance. Since the treatment options for CML currently available are limited, bosutinib may provide an effective therapeutic option for these patients. Jabbour E, Kantarjian H, Ghanem H, O'Brien S, Quintas-Cardama A, Garcia-Manero G, et al. The achievement of a 3-month complete cytogenetic response to second-generation tyrosine kinase inhibitors predicts survival in patients with chronic phase chronic myeloid leukemia after imatinib failure. Clin Lymphoma Myeloma Leuk 2013;13:302-6. Baccarani M, Castagnetti F, Gugliotta G, Rosti G. A review of the European leukemiaNet recommendations for the management of CML. Ann Hematol 2015;94 Suppl 2:S141-7. Hanaizi Z, Unkrig C, Enzmann H, Camarero J, Sancho-Lopez A, Salmonson T, et al. The European medicines agency review of bosutinib for the treatment of adult patients with chronic myelogenous leukemia: Summary of the scientific assessment of the committee for medicinal products for human use. Oncologist 2014;19:421-5. Cortes J, Quintas-Cardama A, Jabbour E, O'Brien S, Verstovsek S, Borthakur G, et al. The clinical significance of achieving different levels of cytogenetic response in patients with chronic phase chronic myeloid leukemia after failure to front-line therapy: Is complete cytogenetic response the only desirable endpoint? Clin Lymphoma Myeloma Leuk 2011;11:421-6. Cortes JE, Kim DW, Kantarjian HM, Brümmendorf TH, Dyagil I, Griskevicius L, et al. Bosutinib versus imatinib in newly diagnosed chronic-phase chronic myeloid leukemia: Results from the BELA trial. J Clin Oncol 2012;30:3486-92. Brümmendorf TH, Cortes JE, de Souza CA, Guilhot F, Duvillié L, Pavlov D, et al. Bosutinib versus imatinib in newly diagnosed chronic-phase chronic myeloid leukaemia: Results from the 24-month follow-up of the BELA trial. Br J Haematol 2015;168:69-81. Cortes JE, Kantarjian HM, Brümmendorf TH, Kim DW, Turkina AG, Shen ZX, et al. Safety and efficacy of bosutinib (SKI-606) in chronic phase Philadelphia chromosome-positive chronic myeloid leukemia patients with resistance or intolerance to imatinib. Blood 2011;118:4567-76. Gambacorti-Passerini C, Brümmendorf TH, Kim DW, Turkina AG, Masszi T, Assouline S, et al. Bosutinib efficacy and safety in chronic phase chronic myeloid leukemia after imatinib resistance or intolerance: Minimum 24-month follow-up. Am J Hematol 2014;89:732-42.
de Souza CA, Pagnano KB, Bendit I, Conchon M, Freitas CM, Coelho AM, et al. Chronic myeloid leukemia treatment guidelines: Brazilian Association of Hematology, Hemotherapy and Cell Therapy. Brazilian Medical Association Guidelines Project – 2012. Rev Bras Hematol Hemoter 2012;34:367-82. Khoury HJ, Cortes JE, Kantarjian HM, Gambacorti-Passerini C, Baccarani M, Kim DW, et al. Bosutinib is active in chronic phase chronic myeloid leukemia after imatinib and dasatinib and/or nilotinib therapy failure. Blood 2012;119:3403-12. Kantarjian H, Giles F, Wunderle L, Bhalla K, O'Brien S, Wassmann B, et al. Nilotinib in imatinib-resistant CML and Philadelphia chromosome-positive ALL. N Engl J Med 2006;354:2542-51. Kantarjian HM, Giles F, Gattermann N, Bhalla K, Alimena G, Palandri F, et al. Nilotinib (formerly AMN107), a highly selective BCR-ABL tyrosine kinase inhibitor, is effective in patients with Philadelphia chromosome-positive chronic myelogenous leukemia in chronic phase following imatinib resistance and intolerance. Blood 2007;110:3540-6. Hochhaus A, Kantarjian HM, Baccarani M, Lipton JH, Apperley JF, Druker BJ, et al. Dasatinib induces notable hematologic and cytogenetic responses in chronic-phase chronic myeloid leukemia after failure of imatinib therapy. Blood 2007;109:2303-9. Shah NP, Kantarjian HM, Kim DW, Réa D, Dorlhiac-Llacer PE, Milone JH, et al. Intermittent target inhibition with dasatinib 100 mg once daily preserves efficacy and improves tolerability in imatinib-resistant and -intolerant chronic-phase chronic myeloid leukemia. J Clin Oncol 2008;26:3204-12. Amsberg GK, Schafhausen P. Bosutinib in the management of chronic myelogenous leukemia. Biologics 2013;7:115-22. Amsberg GK, Koschmieder S. Profile of bosutinib and its clinical potential in the treatment of chronic myeloid leukemia. Onco Targets Ther 2013;6:99-106. Breitscheidel L. Cost utility of allogeneic stem cell transplantation with matched unrelated donor versus treatment with imatinib for adult patients with newly diagnosed chronic myeloid leukaemia. J Med Econ 2008;11:571-84. Reed SD, Anstrom KJ, Li Y, Schulman KA. Updated estimates of survival and cost effectiveness for imatinib versus interferon-alpha plus low-dose cytarabine for newly diagnosed chronic-phase chronic myeloid leukaemia. Pharmacoeconomics 2008;26:435-46. Chen Z, Wang C, Xu X, Feng W. Cost-effectiveness study comparing imatinib with interferon-alpha for patients with newly diagnosed chronic-phase (CP) chronic myeloid leukemia (CML) from the Chinese Public Health-Care System Perspective (CPHSP). Value Health 2009;12 Suppl 3:S85-8. Hoyle M, Rogers G, Moxham T, Liu Z, Stein K. Cost-effectiveness of dasatinib and nilotinib for imatinib-resistant or -intolerant chronic phase chronic myeloid leukemia. Value Health 2011;14:1057-67. Ghatnekar O, Hjalte F, Taylor M. Cost-effectiveness of dasatinib versus high-dose imatinib in patients with chronic myeloid leukemia (CML), resistant to standard dose imatinib – A Swedish model application. Acta Oncol 2010;49:851-8. Kluibenschaedl M, Rochau U, Stenehjem D, Kuo KL, Ordera G, Brixner D, et al. 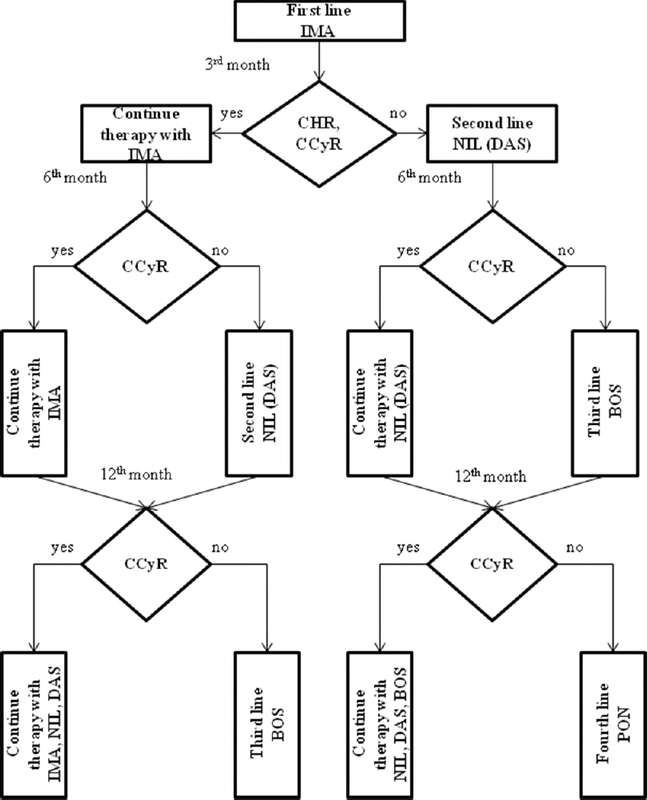 Cost-effectiveness of the sequential application of tyrosinekinase inhibitors for the treatment of CML patients in the US. Society for Medical Decision Making. Poster 2014;PS4-17. Summary of Product Characteristics Imatinib. Available from: http://www.bda.bg. [Last accessed on 2015 Dec 15]. Summary of Product Characteristics Dasatinib. Available from: http://www.bda.bg. [Last accessed on 2015 Dec 15]. Summary of Product Characteristics Nilotinib. Available from: http://www.bda.bg. [Last accessed on 2015 Dec 15]. Summary of Product Characteristics Bosutinib. Available from: http://www.bda.bg. [Last accessed on 2015 Dec 15]. Summary of Product Characteristics Ponatinib. Available from: http://www.bda.bg. [Last accessed on 2015 Dec 15]. Dasatinib, high-dose imatinib and nilotinib for treatment of imatinib – Resistant chronic myeloid leukemia (CML), and dasatinib and nilotinib for people with CML for whom treatment with imatinib has failed because of intolerance. NICE Technology Appraisal Guidance Ta241; January, 2012. 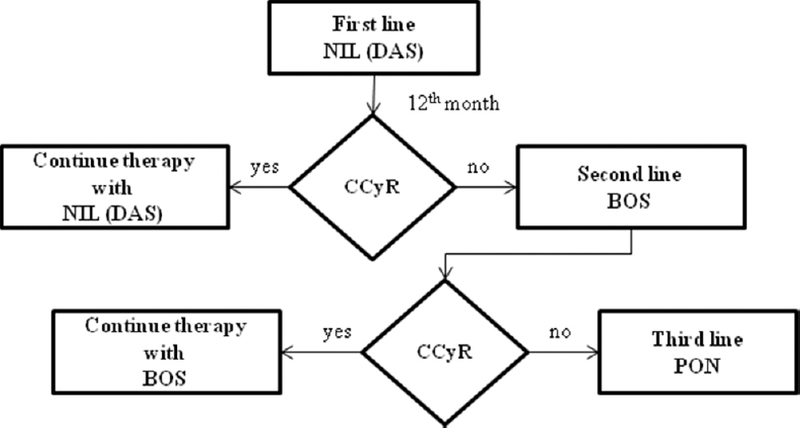 Dasatinib, nilotinib and standart dose imatinib for the first – Line treatment of chronic myeloid leukemia. NICE Technology Appraisal Guidance Ta251; April, 2012. Bosutinib for previously treated chronic myeloid leukemia. NICE Technology Appraisal Guidance Ta299; November, 2013. Methodical Guidelines for Diagnosis, Treatment and Monitoring of Patients with Disease of the Blood and Blood Forming Organs, Bulgarian Scientific Society of Clinical and Transfusion Haematology; May, 2011. Available from: http://www.bscth.med-bg.info. [Last accessed on 2015 Dec 02]. Valerianova Z, Dimitrova N, Tonev S, Vukov M, editors. Cancer Incidence in Bulgaria 2012. Paradigma. Bulgarian National Cancer Registry. Sofia, 2014; Vol XXIII, ISSN: 1314-7315. Shieh MP, Mitsuhashi M, Lilly M. Moving on up: Second-line agents as initial treatment for newly-diagnosed patients with chronic phase CML. Clin Med Insights Oncol 2011;5:185-99. Pavey T, Hoyle M, Ciani O, Crathorne L, Jones-Hughes T, Cooper C, et al. Dasatinib, nilotinib and standard-dose imatinib for the first-line treatment of chronic myeloid leukaemia: Systematic reviews and economic analyses. Health Technol Assess 2012;16:iii-iv, 1-277.